Are you ready to experience a sacred Presence that can heal you in this life and prepare you for the next? On October 5-14, 2017 Clare and I will be leading “The Healing Road From Languedoc to Lourdes“, a spiritual pilgrimage (or magnificent escape) to southern France. Our ‘outer’ destination is the spectacularly beautiful Languedoc or “Cathar country”, as it is also known, and then, on to Lourdes, one of the world’s most sacred places. They say there is an ambiance or sense of peace and calm at Lourdes that does not exist anywhere else. Visitors feel it as soon as they enter the ‘field’ of the place. I will propose an explanation for how this happened. The area is infused with the most holy healing light of Mary in her light body form. I call it the Presence Beautiful. Mary beatified or glorified Lourdes with this Presence. She made it a holy place. 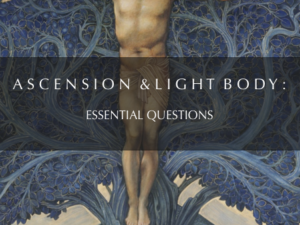 Our ‘inward journey’ is focused on the ’light body’ teachings of the Cathars and their forerunners, the Essenes, who instructed Mary in the practice of the light body realization. As I write in my forthcoming book, “The Essenes and the Perfect Rainbow Light Body: Ascension to the Celestial City”, the Cathar perfecti (Parfait or Perfectae) were male and female ascetics who claimed knowledge of how to perfect the human body into a more pure or illumined state of being and ascend to a celestial city. 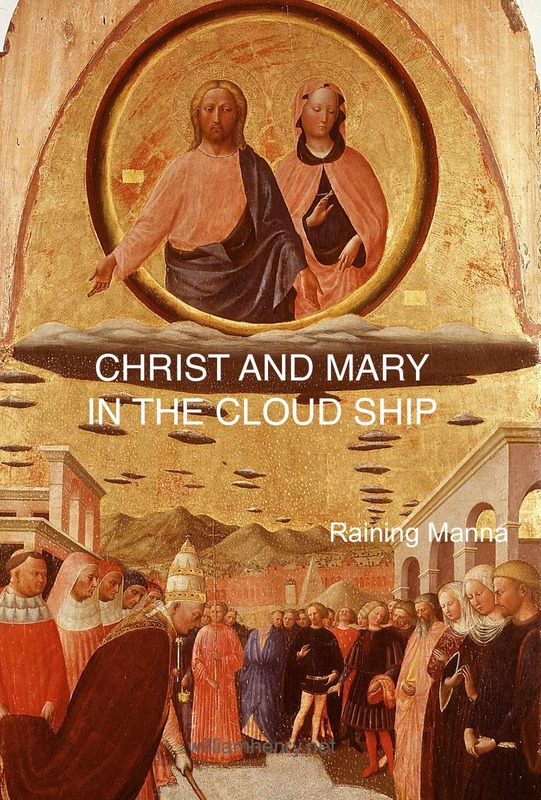 They walked away from the world in order to follow Christ and Mary Magnifique in their transfiguration and ascension into an angelic or spiritualized body, and enter the heavenly realm, a dimension inhabited by blessed spiritual beings. 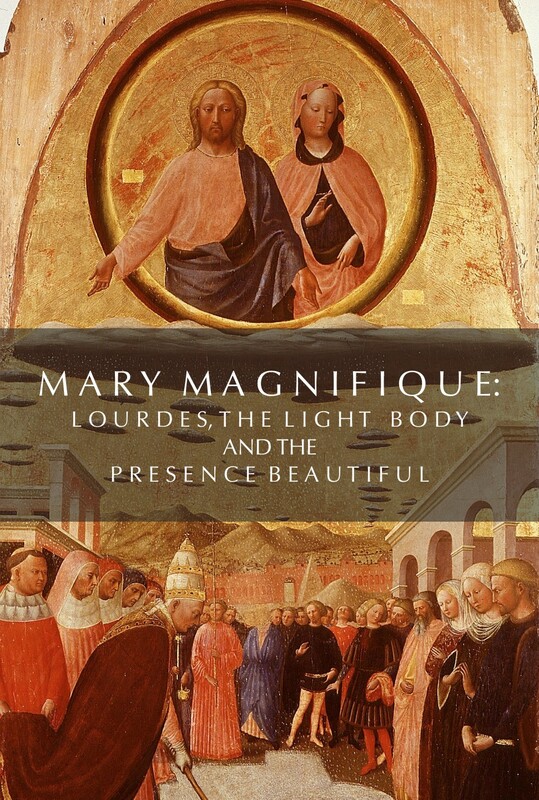 I use the title Magnifique to combine the attributes of Mother Mary and Mary Magdalene. They both achieved the title of “Mary” and ascended, according to French tradition. The arc of our journey will take us to an understanding of (the) Mary’s ascension and appearances, including in Lourdes in 1858. According to Christian tradition dating to the fifth century, Mary was assumed or ascended to heaven at the end of her earthly life. During our tour (as well as during our Nashville Ascension event, April 1-2, 2017), I will show how Mary Magnifique became a perfected light being and how her appearance or apparition to a young girl in Lourdes in 1858 led to an infusion of sacred light that millions of people are drawn to for healing every year. Not only can the light of Lourdes heal us in the visible world, as I will show, it can prepare us for entering Dimension of the Blessed. On our pilgrimage, our goal is to ‘feel the Force’, to receive this sacred light, and to be made more whole, holy and complete by her presence. Viewing the Catholic Church (Roma) as corrupt and devoted to Satan, who they believed created the visible, material world, the Cathars claimed they practiced the pure and original form of Christianity (called Amor, love, the reverse of Roma) first established by the Essenes. The Essenes were scholarly mystics who spent nearly two hundred years from 150 B.C. 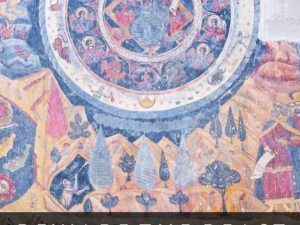 to 70 AD fusing estoteric Buddhist, Zoroastrian, Egyptian and Judaic teachings about human transformation or perfection into celestial beings into a practice aimed at transmuting the human body into light. These practices were enhanced with knowledge derived from the Essene’s Close Encounters with angels or celestial beings who they claimed were living with them. Jesus embodied these advanced practices and modeled them in his perfection and resurrection. Following in the footsteps of the Essenes, who called themselves Children of Light and Men of Perfect Holiness, and who were trying to build their community into a House of Perfection, the Cathar perfect ones can be thought of as reincarnations of the Essenes in more than just their beliefs and spiritual practices. The Cathar title, perfecti, is the same as the Essenes and for good reason. They sought to fulfill Jesus’s teaching in Matthew 19:21: If thou wilt be perfect, go and sell that thou has, and give it to the Ebionites (the Poor), and thou shalt have treasure in heaven: and come and follow me”. As Perfects they were seen to be “equal to the angels” in every form, including the spiritualized nature of their ‘light’ bodies. In Christian art, the light body is symbolized by a white robe. 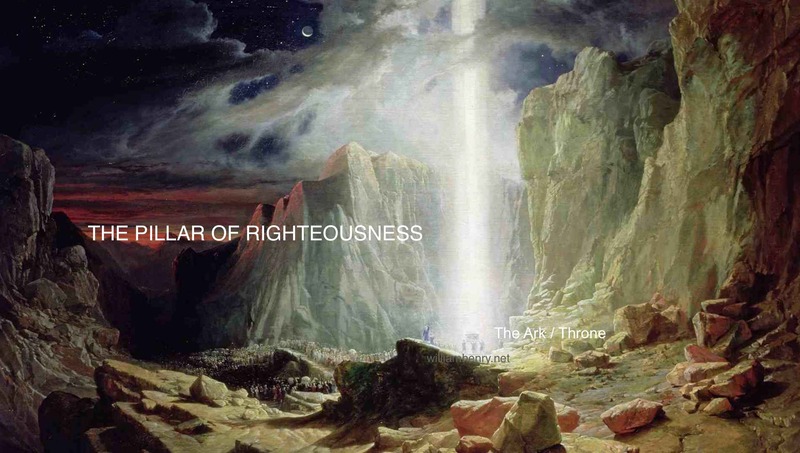 The perfected ones wear the white robes and surround the Throne of Christ, located in a celestial city called Sion, where Jesus is shown enthroned on a rainbow, the symbol of his power of resurrection. As with the Essenes, who were exterminated by Rome just after the time of Jesus, the Cathars were hunted by Rome and eliminated during the first European genocide (1200-1244) in order to destroy these teachings about human transformation and knowledge of how to ascend to the celestial city. My investigation into the Essene and Cathar secrets of Perfection took a giant leap forward in 2006 when I was introduced to the Tibetan Great Perfection (‘Dzogchen’) teaching. In this extraordinary and other worldy practice, Great Perfection practitioners seek to complete their lives by self-realizing the primordial state of pure awareness and dissolving or spinning their body into a vortex of transparent energy that manifests as five colored rainbow light or the perfected Rainbow Body of Light, leaving behind hair, toe and fingernails, which have no nerves to be transmuted. Once in the Rainbow Body, the perfected one is translated or ascends to the Pure Land, a state of being equivalent to Christ’s heavenly realm, Sion. 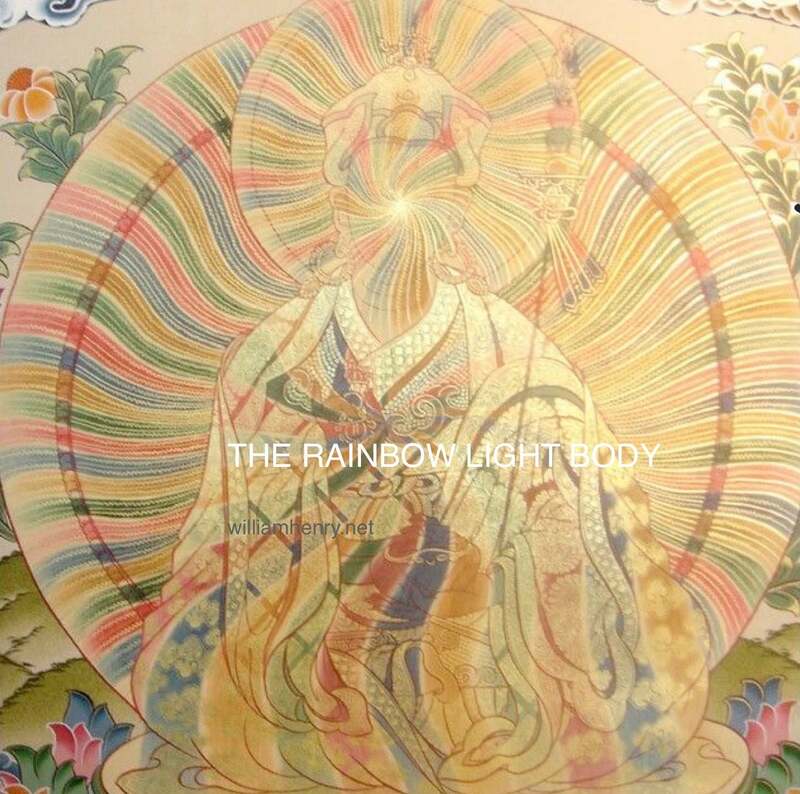 Tibetan sacred art portrays this transformation as a flowing, vibrating, pulsating, robe of rainbow light enlightened with gold. As in the example shown here, the swirling rainbow bodies of the Tibetan perfected ones resemble a plasma globe with rainbow filaments extending from their heart center. This new, glowing body is the Merkaba vehicle spoken of by the Essenes in which the soul ascends (and descends). As I discussed “Born Again Into the Resurrection Body“, it is what Christians mean by being “born again”. 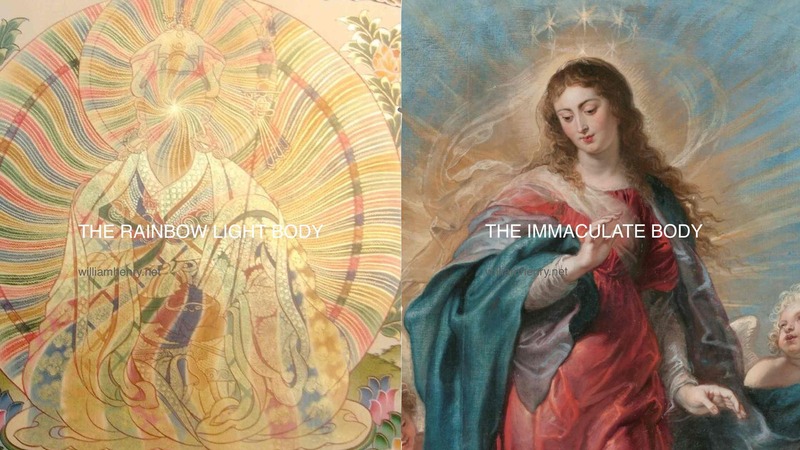 Mary’s Immaculate Body matches the Tibetan Rainbow Light Body. The rainbow body matches Ezekiel’s description of Yahweh as a luminous, humanoid figure sitting amidst a rainbow light on the Ark of the Covenant, Enoch’s transformation into a glorious body of light that matched the body of the angels, and Christ’s Resurrection Body. Ezekiel. Enoch. Jesus. All are named as members of the Essenes. In “The Essenes and the Perfect Rainbow Light Body”, I equate, for the first time in print, the Essene teachings on Perfection with the Tibetan Great Perfection. As I will reveal, the Dead Sea Scrolls contain a manual for manifesting the Rainbow Light Body. The Cathars revived this practice in the Languedoc. In Tibetan tradition, these mystery teachings are called Terma (‘Sacred Treasure’) and were hidden in caves, temples, and even entire regions, that were supposed to be discovered by treasure hunters. Guru Padmasambhava, who brought the Great Perfection teaching from India to Tibet in the 8th century, and his consort, Yeshe Tsogyal, are believed to still be active on earth in their Rainbow Light Bodies. They seek to assist awakened ones in completing their perfection and ascension. These teachings, says Janet Gyatso, Harvard Divinity School specialist in Buddhist studies, are buried in the consciousness of his disciples. They are supposed to come out of these disciples and be will be revealed to the world. It is my belief that the reincarnating Essenes and Cathars hold these teachings in their soul. The terma are the sacred treasures Jesus promised to those who follow him. When the Essenes and Cathars come together they recreate the House of Perfection and the teachings are revealed. 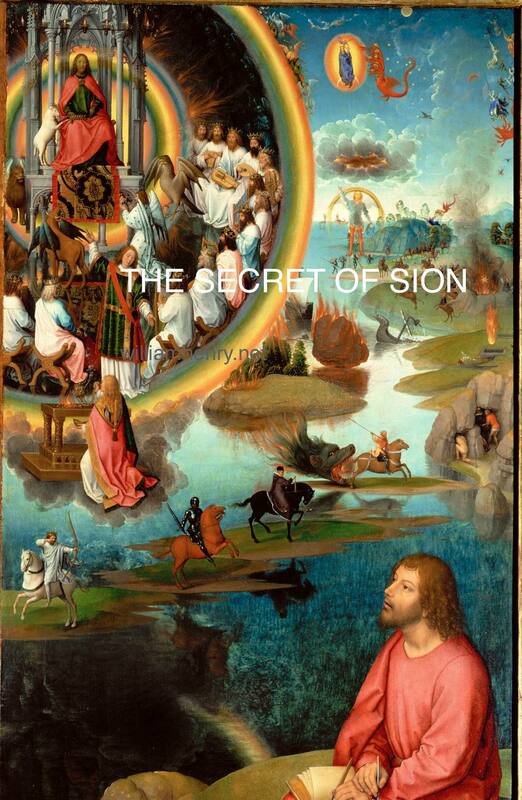 As I discussed in The Secret of Sion, the terma tradition matches ancient Sumerian texts telling of celestial beings coming to earth with the Tablets of Destiny or the Heavenly Book. Transmittable, containing supreme wisdom about the law and workings of the universe, and attainable by all, the Heavenly Book contains the keys to our ascension. After my light body ‘awakening’ in 2006, I began to realize that these terma contain the codes for completing the Rainbow Light Body. Entering into the field of this sacred place with like-minded souls energizes our memories and activates our consciousness. During our tour, “From Languedoc to Lourdes”, we will trace the light trails of the sacred path of these luminous “Perfect Ones” who sought their ascension in magnificent castles in the sky constructed in the Pyrenees. As I wrote in my 2000 book, “Blue Apples: A Search for the Lost Stargate Technology and Spiritual Teachings of Jesus and Mary Magdalene,” the Cathars claimed they possessed a secret gospel of Jesus called the Book of Love. Believed to be the original initiatory and heretical version of John (the only gospel the Cathars read), the Book of Love is a ‘secret’ manuscript attributed to Jesus who transmitted it to John the Divine. Hieronymous Bosch captures a blue avian/Angel of Light transmitting the book to John from atop a holy mountain (highly reminiscent of Montsegur in Cathar Country). Mary emerges from the portal in the upper left. As I discussed in “Blue Avians and Blue Sphere Beings: Do You Know What Love Can Do? these beings have extraordinary inter-dimensional capabilities. This book was the foundation of the Church of Love (Amor). It is equated with the Holy Grail, otherwise known as the Stone of Resurrection. I have been seeking the Book of Love since first learning about it in 1996 in Elizabeth VanBuren’s mighty book, Refuge of the Apocalypse. The existence of the Book of Love, she says, was revealed when the Church subjected the Cathars to torture. Its contents were said to transform ordinary men into supermen, or Homo sapiens into Homo Christos. Its power, says Van Buren, was such that it could cause all hatred, all anger, and all jealousy to vanish from the hearts of men. Once ignited, the Christ Light of Amor or Love, like a new flood, would submerge all souls and never again would blood be shed on this Earth. The German mythologist, Otto Rahn, believed the Pure One’s mastery of the Book of Love enabled them to participate in the ultimate human experience: transforming or metamorphosing themselves into beings (or ‘flow-ers’) of light and becoming immortal inhabitants of the indescribably beautiful world(s) of Amor. While visiting the Languedoc in 1998, I had an opportunity to meet Ms. VanBuren at her home in Luc-sur-Aude. I explained to her that, the day after an interview with Art Bell on Coast to Coast am about the Languedoc and how its soil was infused with a light substance that promoted human longevity, all of my research on this subject was stolen from my home, including my copy of her book. She promptly reached into a cabinet in her living room and handed me a replacement copy from her personal stash. Then, to bring even more magic to the special moment, she signed the book! “To William, Bill, Beaky, Bird Man. A brief but significant meeting,” she wrote. According to local tradition, the Book of Love is still hidden somewhere in the Languedoc. My experience tells me we have to go beyond the seen, the known and the limited. This I have done over the course of nearly twenty years of research. In addition to “Blue Apples” my books, “The Crystal Halls of Christ’s Court” (2003), “Mary Magdalene: The Illuminator” (2005) and “The Secret of Sion” (2011) feature my developing views on the Book of Love. 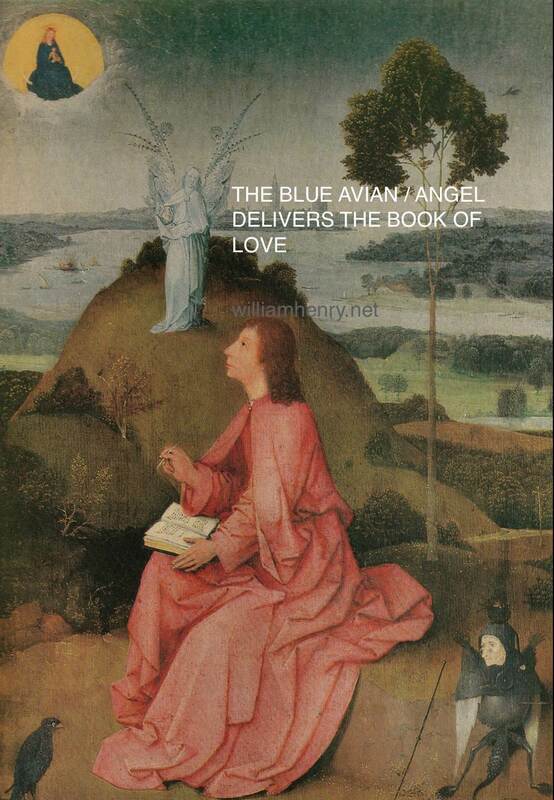 Then there is my presentation “The Book of Love”, available on Gaia. Finally, in my 2012 book, “The Judgment Day Device,” I ‘broke through the veil’ and identified the Book of Love as the book found on the Etimasia or Throne of the Second Coming of Christ. Most are unaware that Christ has a throne and that it is due to be reassembled during the End Times. This ‘device’ is featured mainly in Eastern Christian art (and largely unknown in the West). 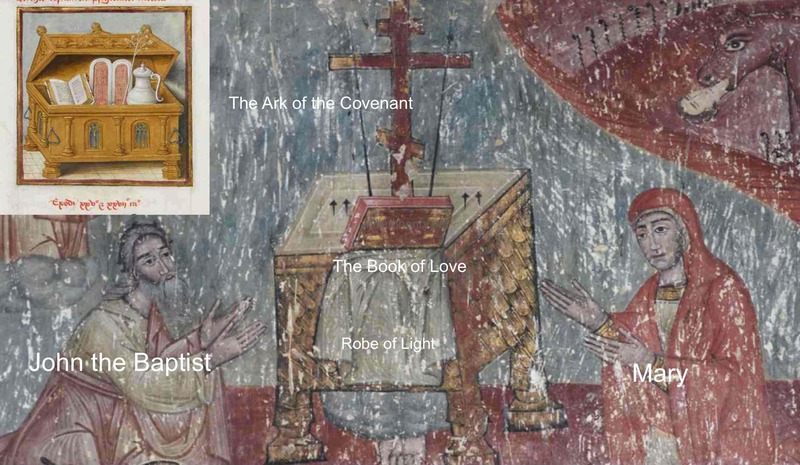 It is a kit assembled by Jesus’s brother (it’s their family property) that includes the Ark of the Covenant, the Rod of Enlightenment / Pillar of Light, the Robe of Light, the Flask of Manna and the Book of Love. 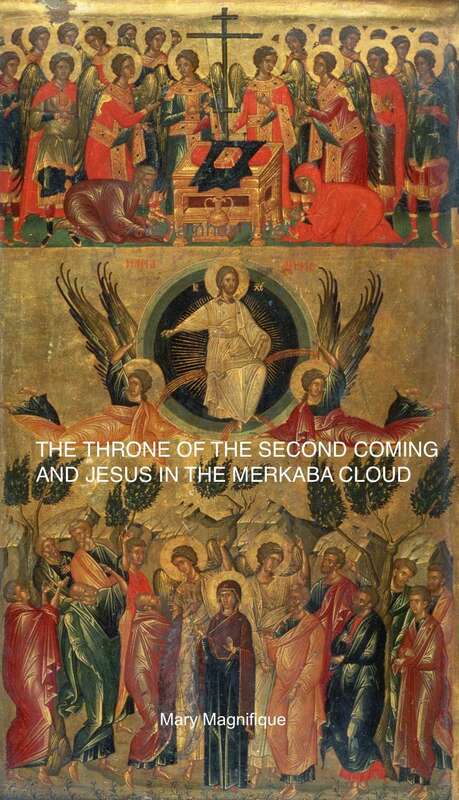 When the Throne is assembled and ‘activated’, Christ appears above it in a cloud ship of light. From this cloud rains manna, the food of the angels, and the light substance I believe is infused in the soil of the Languedoc. Hence, the assembler of the Throne is called the Rainmaker. This Throne is the key piece to the End Time prophecies of Judaism, Christianity and Islam. I think of the Book of Love as the ‘instruction manual’ for assembling the Throne and bringing in the rain. The Essenes and the Cathars made it clear that our body corresponds to this throne. Our bodies bring the rain. As we assemble this ‘ascension kit’ within ourselves, beginning with purifying our hearts, we are changed and capable of being charged by the Christ Light. This is why the Etimasia is the symbol for the ‘lost’ ascension teachings of Christ. Having ‘made’ the Book, let’s now examine another vital piece in the kit, the Robe of Light. In so doing, we will take one beautiful step closer to understanding how it was possible for Mary Magnifique to appear at Lourdes and how her Presence heals us can help us to complete our own ascension. The Cathars believed each individual possessed a spark or particle of Divine Light that was trapped in a garment of earthly flesh made by Lucifer, one of the Watcher angels. These angels previously lived at God’s throne. Our Divine Particle, or souls, once dwelled with them in glorified light bodies or celestial bodies referred to as the Robe of the Soul. When the Watcher angels fell to earth, and entered the visible universe, they left these light bodies and took on flesh and blood bodies. According to Essene and Cathar teaching, we are all fallen angels. Our earthly purpose is to realize our spiritual predicament and to reverse the fall, uniting the Divine Spark and the glorified light body. The Book of Love is the manual for perfecting this light body. The teachings of the Persian prophet, Mani, highly influenced Cathar thinking regarding the Divine Spark, and offer important insight into the Book of Love and its ascension practice. They provide a crucial script for us to follow. One source of Mani’s teachings was the original Aramaic writings relating to the Book of Enoch and the Book of Giants, both attributed to the Essenes and found among the Dead Sea Scrolls. In The Secret of Sion, I cited scholar, Andrew Welburn, who explains in Mani, the Angel and the Column of Glory, that the key tenet of Manicheaism is the meeting with an Angel. Every Manichean expected to meet angelic figures after death: notably the white-clad emissary, the Wise Guide, if he were one of the Elect. Mani, however, met his Angel during life. This encounter transformed Mani into an Apostle of the Christ Light, which he believed was present in every tree, herb, fruit, vegetable and even the stones of the soil. He referred to the Angel as his Divine Light-self, or his Twin — al Taum the ‘Twin’. Taum, we note, is phonetically the same as Tom, the short version of Thomas ‘the Twin’ (which is derived from the name of the apostle Thomas, the “twin”). Mani enjoyed the protection and sacred wisdom of this being, becoming the Angel of Light. Two, transmit the Robe of Light. Three, once the Angel brings us to self-realization, it escorts us to the Pillar of Light referred to as the Column of Glory. Tzaddik (‘Righteous’) is one Hebrew name for this cosmic conduit between planes or dimensions. It manifests via the Ark of the Covenant…and the Etimasia Throne of the Second Coming. As we raise our souls, we raise the souls all of humanity, the world and everything in it. According to S.R. Maitland, writing in his History of the Albigenses and Waldenses, the mission of the Perfect was to assist and show others the way to attain their angelic status, release their Divine Spark from the cycle of earthly incarnation and return to the glorified light body. To achieve the light body, the Cathar Perfect performed a ceremony called the Consolamentum, a spiritual baptism thought to be similar to Pentecost (practiced by the Essenes, who learned it from Akhenaton), in which the Holy Spirit is transmitted to the rank and file Cathars. 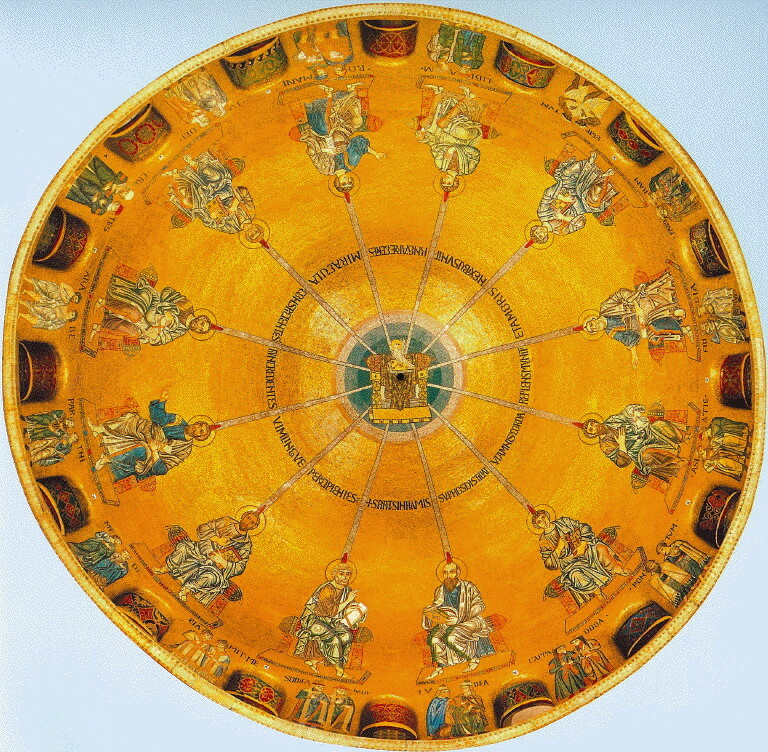 During the Pentecost ceremony, the im-perfect connect their consciousness to the Etimasia Throne of Christ. A fire or frequency of the Holy Spirit, which was symbolized by a dove, and believed to have been sent by Christ, is then transmitted from heaven and transforms the ordinary, imperfect one into a Perfect one. A dove symbolizes the Holy Spirit. Often, it is seen sitting on the Book of Love in Etimasia scenes. They go together. The Consolamentum removed all sin and restored the glorified or angelic light body / garment of immortality. A Consoled person is an angel in the flesh of the angels. 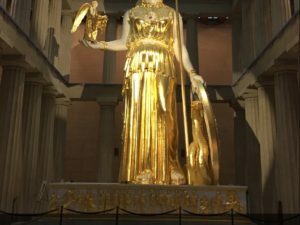 As I will elaborate in my presentation on April 1-2, 2017 in Nashville, Mary completed the earthly cycle of self-realization and continues to manifest as an Angel of Light in order to further illuminate the world. After 8 days in the Languedoc, our tour will proceed with four days in Lourdes. Lourdes is an amazingly beautiful place. It was made holy by a visitation of the Virgin Mary in 1858. She appeared as a lady in white light to a young girl. The term ‘made’ holy was illuminated for me by Dr. Margaret Barker, who notes that certain objects are sacred. Others can make objects holy by their presence and are referred to as most holy. The Ark of the Covenant is one of these most holy devices that make other devices holy. In Catholic tradition, Mary replaced the Ark of the Covenant as the holy vessel (or Theotokos). What is not often discussed is her ability to make places and people holy by her presence. This presence is the highest love possible one can experience on earth. I call it the Presence Beautiful. During a total of 18 appearances at Lourdes, the White Lady, began the process of infusing Lourdes with Presence Beautiful. Bernadette recited the rosary and went into trances. She was given three “secrets,” asked to pray for the conversion of sinners and told that the Lady promised to make her happy not in this world but in the next. 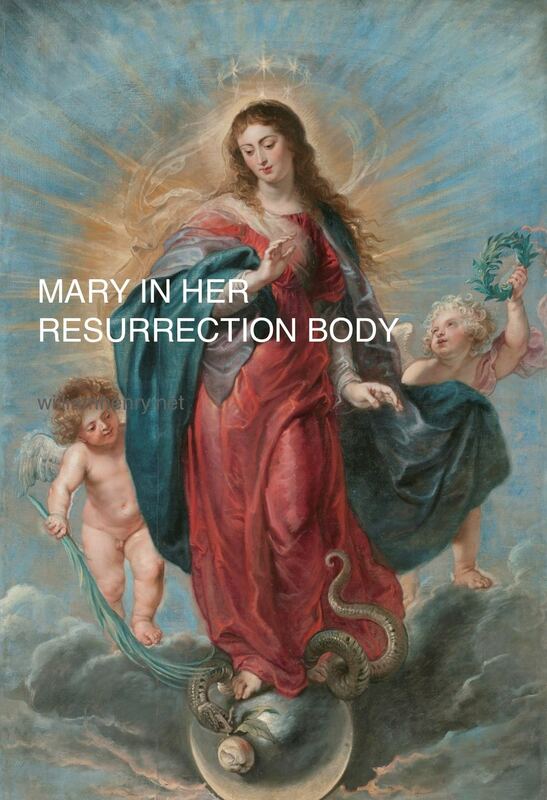 So, what we have here is an episode in which Mary crossed over from the Dimension of the Blessed, contacted a human being, and made her holy so that she could complete her ascension. This is exactly what the Essenes claimed the angels did for them. The Lady announced her name as “I am the Immaculate Conception,” thereby confirming the recently defined dogma. In 1854, the Immaculate Conception became an official article of faith in the Roman Catholic Church. To be Immaculately Conceived means her soul is free from original sin. A body free from sin or earthly imperfection is called the Perfect Body, the Light Body or the Glory Body. The immaculate white clad lady ‘angel’ obviously rings of the white-clad Angel of Light described by Mani. 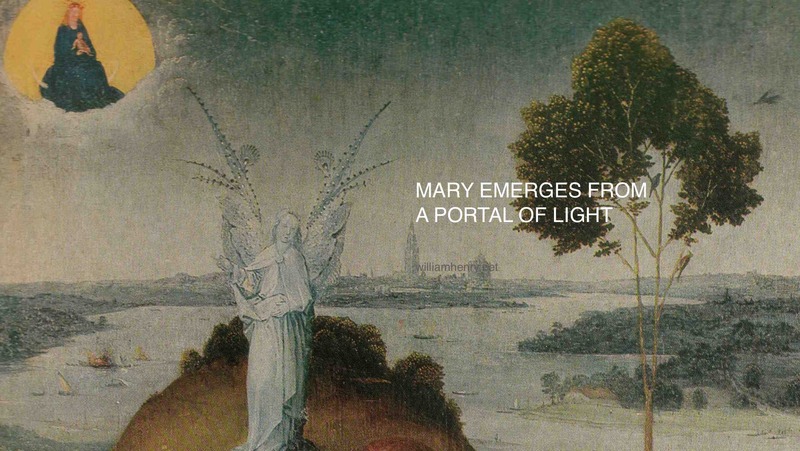 More, when Mary’s appearance is viewed through the Essene, Manichaean and Cathar lens, it reveals that her apparition body is the Rainbow Light Body. In my view, as a glorified saint, Mary is at least equivalent to Yeshe Tsogyal who hid the terma and infused the valleys of Tibet with the energy of the Rainbow Body. The Tibetans also say that when a perfected one has attained the Rainbow Body they can phase between earthly and celestial states of being. During her visit, Mary asked Bernadette for a procession and a chapel, and instructed her to dig for a spring, which was already known to exist. In the following October, the Church authorities took charge, the results being that the apparitions were confirmed as of the Blessed Virgin, the cult of Our Lady of Lourdes was authorized, and plans were put in motion for building a sanctuary. Mary transformed the landscape of Lourdes by activating a healing spring and creating a portal to the Dimension of Blessed now accessed by millions of people every year. In Catholic teaching, Mary not only replaced the Ark of the Covenant, she also became the new Eve. Jesus became the Second Adam. What is lacking in Catholocism is the Essene and esoteric Jewish teachings that say when Adam and Eve lived in the Garden of Eden their bodies were the same as the angels, meaning they were composed of celestial flesh. When we are taught that Eve was pulled from the flesh of Adam, this means she was pulled from Adam’s light body. After they committed the first sin, Adam and Eve were evicted from Eden and were given coats of skin…human skin, says esoteric Jewish teaching. This concealed their original light bodies. More, this original sin left Adam and Even in debt. In this belief, humanity is one body. As goes with Adam and Eve, so goes with the rest of humanity…including us. Christians believe we must repay Adam and Eve’s debts. To be free of the debt of sin not only means to be debt free in the visible world (for more on this please see my blog “Prosperity and the Light Bodyhttp://www.williamhenry.net/2016/07/prosperity-and-the-light-body-joel-osteen-says-something-big-is-coming-your-wayand-i-believe-him-but-not-for-the-same-reason/), but it also means to be free of the limitations of the human body…to return to our glorious light bodies…and become citizens of the Dimension of the Blessed. As we discussed, attaining sovereignty from this debt is known as the Great Perfection and transformation into Rainbow Light Bodies. Catholicism teaches that Adam as the “head” of the human body. The old head that is. What is required to pay our debts is a “new head”. Humanity had /has to reverse the thinking of the old head and replace it with a new head and a new body. Enter Jesus, the “New Adam” and his teaching (the Book of Love) about manifesting a new light body that can pay Adam and Eve’s debt and a new “body of Christ”. As the New Eve, and the Theotokos, the Mother of God, the Mater Dei, is considered to be the necessary perfect and pure vessel of Christ’s Incarnation. Just as the Ark of the Covenant was where God came down in the Old Testament to speak to his people, so too was Mother Mary Magnifique the Ark of the New Convenant where God came down to his people. The Coptic (Egyptian Christian) church celebrates Mary with various ‘devices.’ They call her the Second Tabernacle, Jacob’s Ladder, the Ark of the Covenant, the Vessel of Manna, the Golden Lampstand, the Burning Bush. All of these terms signifiy that Mary attained (or regained) her angelic body, her Rainbow Light Body. As noted, preparation of the new body, or rather its transformation, is the subject of Essene teachings and the practice of Pentecost. 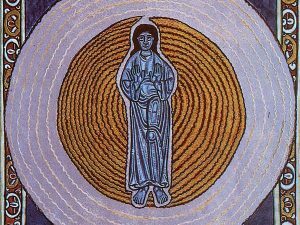 It is easy to see Mary as an Essene initiate who completed a cycle of meditation and instruction to prepare her body to be the vessel of Christ. The Apparitions of Mary at Lourdes affirm the Church dogma that Mary’s body and soul was transformed, it was ‘immaculate’, perfect and pure (Cathar), and that she ascended into a new bodily form. The Catholic Church teaches as dogma that the Mother of Christ “having completed the course of her earthly life, was assumed body and soul into heavenly glory.” Many believe she was miraculously resurrected and ascended directly to heaven. 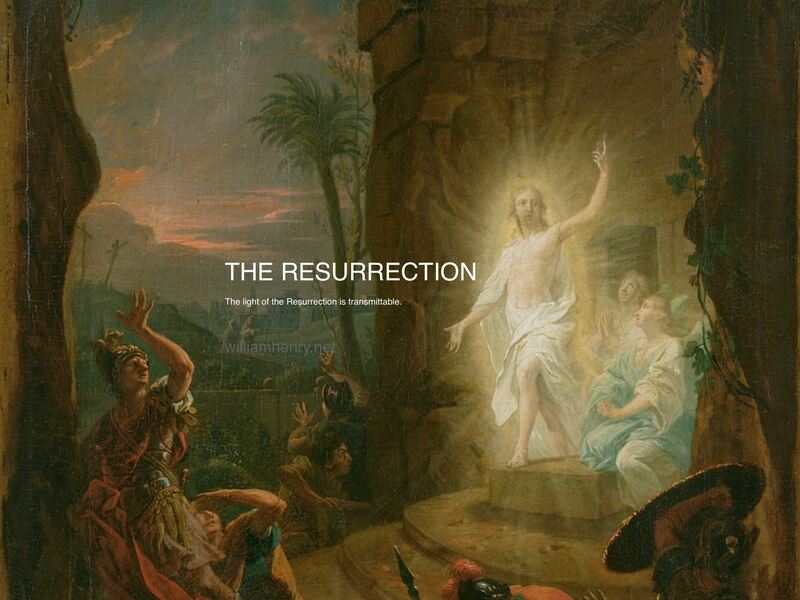 To resurrect means to change from earthly flesh to celestial or heavenly flesh. ‘Heavenly glory’ is a state of being in which the soul inhabits a radiant, humanoid form that is glorified, meaning it glows rays. This state of being matches the original light bodies of Adam and Eve, the angels, and was the goal of the Essene mystics. 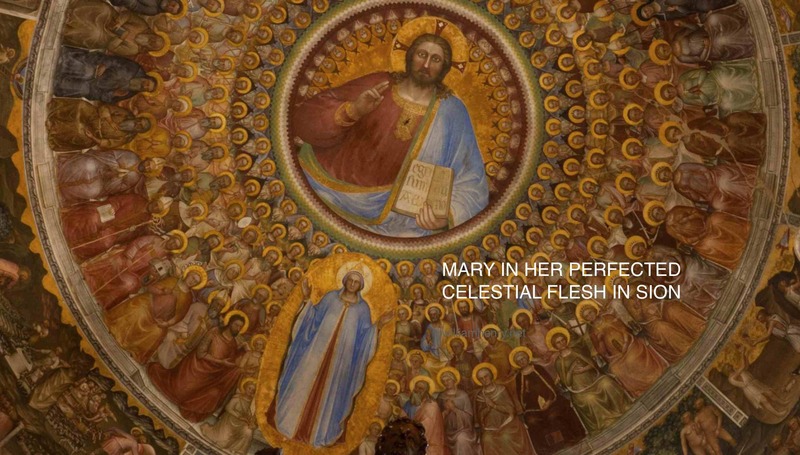 In her ascension, Mary became one of those most holy beings. When she manifested as an apparition in Lourdes in 1858 she did so in her light body or celestial flesh form and altered the land by infusing it with her Presence Beautiful. In my view, she is the Angel of Light who possesses the heavenly Book of Love and seeks to offer it to us. She is waiting in the Languedoc and in Lourdes. Clare and I hope you will join us on our pilgrimage to this very special and holy place and enhance (y)our connection to her Presence…and maybe more. William great blog as usual!! Looking forward to the new book! Brilliant, insightful and uplifting. Grazie! Thank you, all is very clear to me now. I was raised by my grandmother who was a saint. She performed many miracles and I was always on her lap while she read the bible until her death when I was 6. I went to India to find my Guru in 1963 and found a being of pure love and light named Neem Karolie Baba. He initiated me into his son at the age of 20 and I spent the next 6 tears in caves and a hermitage meditating on the rainbow body. I have many Terma teaching and am a padmasambhava practiciner from a enlightened lama. Now it all comes full circle after going to Orion and connecting to Isis in the Kings chamber on 1964 before going overland to India to meet the last great tibetan Lama,s. Thank you very much. I am 73 now and the life of a recluse in Guatamala on a sacred lake. i am working on a rainbow body in this life or going to the pure land of Amitabha in death.